More than 70 guests attended the groundbreaking celebration of Society for the Blind’s new training center – an expansion of the Sacramento nonprofit’s current facility that also will include a teaching kitchen for seniors and a dedicated room for the music program. 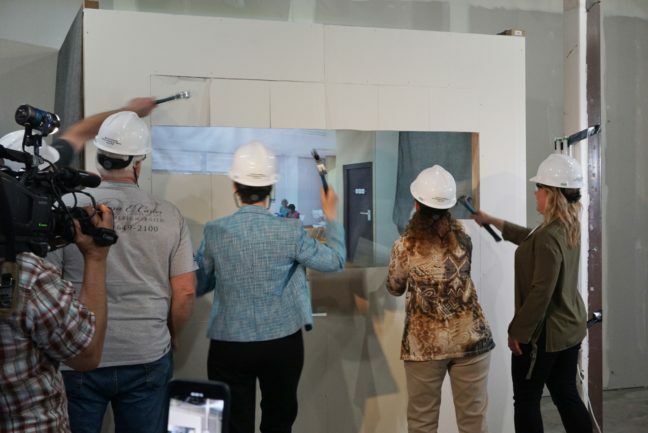 The April 8 event included refreshments, a program and a wall smashing ceremony. The expansion is part of Society for the Blind’s Vision 2020 campaign. There are more than 100,000 people with vision loss in the greater Sacramento region, but Society for the Blind is working at capacity serving more than 5,000 children, working-age adults and seniors each year. The campaign has raised more than $3.5 million to serve the growing number of seniors in need of services to stay independent, empower all clients through education and training, create an endowment, expand the onsite Low Vision Clinic, upgrade technology and complete the training center. Celebrating its 65th anniversary this year, Society for the Blind has created innovative ways to empower individuals living with low vision or blindness to discover, develop and achieve their full potential. Society for the Blind has grown from a dedicated group of volunteers to a nationally recognized agency and the only comprehensive rehabilitative teaching center that provides services for a 27-county region of northern California. The nonprofit provides low-vision eye care, life and job skills training, mentorship, and access to tools to maintain independence for more than 5,000 youth, working-age adults and seniors experiencing vision loss each year. For more information or to make a donation, visit SocietyfortheBlind.org.